Stephen Harper's reign ended this week as PM Justin Trudeau took his oath. 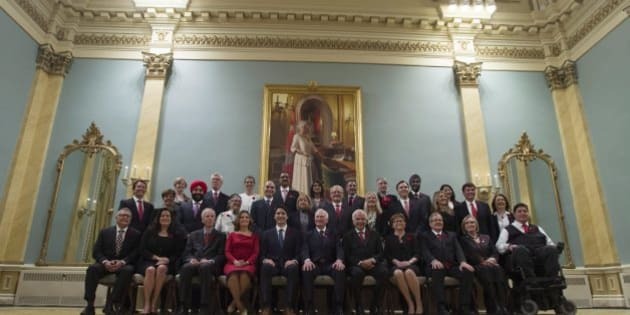 As Trudeau 2.0 picked the persons who will join him at the head table of political power, many in the media trumpet the "most diverse parliament ever." The previous Harper cabinet included women, Aboriginals, South Asians, East Asians, Quebecers and a person with a disability. If that's not diversity, I don't know what is. However, there is room for improvement. No Afro-Canadians were ever part of Harper's caucus. Some demographics don't get a seat at the decision table. Others, which have long-secured their permanent presence, seek their proportional piece of the pie: as a percentage of cabinet, women and visible minorities have been chronically underrepresented. There's some whitesplaining confusion as to what diversity is, and what the measuring sticks looks like. To be clear, diversity is about encompassing a wide array of minorities, not overrepresenting one particular group to the exclusion of others. If Trudeau wanted to improve on diversity in his inaugural cabinet, it's quite a stretch to roll out the "mission accomplished" banner. PM Trudeau set the tone when he declared his cabinet was "a cabinet that looks like Canada." Have we reached Martin Luther King's mountain top? Why didn't anyone tell me? •	members of visible minorities - people, other than Aboriginal peoples, who are non-Caucasian in race or non-white in colour. White women have been in Parliament since 1921 and in cabinet since 1958. They have had a seat at the table ever since, and even (briefly) in the Prime Minister's Office! The Trudeau cabinet's gender parity is a high water mark for women, but it does not advance diversity. Aboriginals are breaking records each successive election, going from five to seven MPs in 2011. The tally now stands at 10. In spite of what you might think of the Harper government, he set the bar for Aboriginal cabinet participation. Aboriginals account for approximately 4 per cent of the Canadian population, and 6 per cent of cabinet. Steven Fletcher, a quadriplegic, was appointed to PM Harper's cabinet in 2008. Minister Fletcher was the first person in history with a permanent disability to be named to the Canadian cabinet. Trudeau increased the number to two. According to Statistics Canada, one out of every five Canadians was a visible minority in 2011. This demographic is heading up -- way up -- to 30 per cent by 2031. The top groups are of citizens of Asian, South Asian and Afro-Caribbean descent. 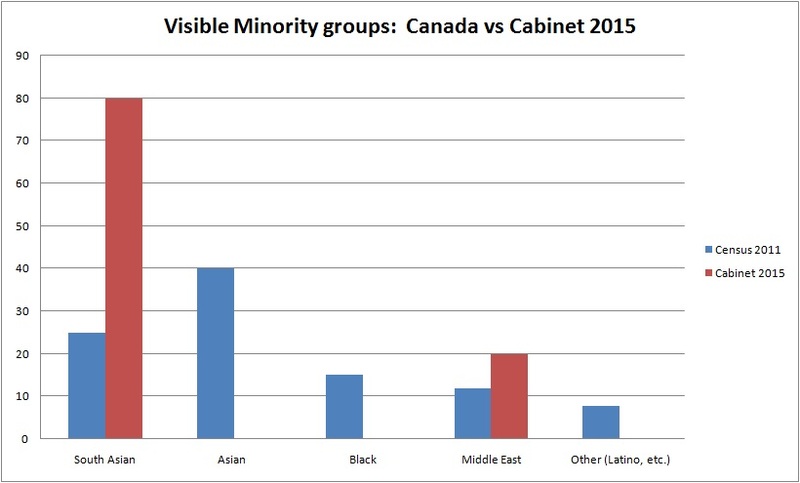 For visible minorities, PM Trudeau's inaugural cabinet is decidedly less diverse than PM Harper's. The absence of East Asians (Chinese, Filipino, Vietnamese, Japanese, Korean, etc.) is jarring. The presence of black Canadians, the third largest racial demographic, is also deficient. Despite a record four Afro-Canadian MPs elected from a voter base blindly loyal to the Liberals, PM Trudeau shut them out of cabinet. Harper did not name any African-Canadians to cabinet. He had no black MPs to choose from. Despite a record four Afro-Canadian MPs elected, Trudeau shut them out of cabinet. As women, Aboriginals and others break out the bubbly to celebrate their historic advances in political clout, lest we forget that the struggle for equality, and fair representation is far from over.